Don’t read this post until you have decided to self-publish and are ready to start exploring your book distribution options (if you are still trying to decide how to publish, read this post first). In this post, I’m going to walk through the different book formats—eBook, paperback, hardcover, and audiobook—and help you decide if you should create them, then explore your options for printing and distributing each version. The easiest place to start is with an eBook because it doesn’t need to be printed, so you’re just left with distribution. Should You Do an Ebook? Yes, if at all possible. There’s almost no reason not to. When eBooks first hit the scene, people said they’d be the end for printed books. That future did not come, and according to recent numbers, it seems to be getting further away…depending on which part of the picture you choose to look at. One report showed unit sales of eBooks dropped from 180 million units to 162 million from 2016 to 2017. Another report showed eBook sales decreased 4.7 percent in 2017. Those numbers only reflect traditionally published eBooks, however. The indie eBook market is thriving, especially for genres like romance, sci-fi, and fantasy. It’s tough to know the total number of eBook sales compared to print books, but estimates put it around 485 million eBook sales to 800 million print book sales in 2017. Whatever is happening with overall sales numbers, almost half a billion sales show that readers still love eBooks. If you have the capacity to create an eBook version of your book, it’s definitely a worthwhile option. TL;DR: Yes, do an eBook. Amazon makes up 83 percent of eBook sales in the US, so it’s a must for authors looking to distribute their eBook. The only question is whether you should distribute solely on Amazon. For the US market, 17 percent of 485 million eBook sales is nothing to sneeze at, especially if you’re looking to reach as many readers as possible. Also, if you’re looking to sell your eBook internationally, keep in mind that other retailers hold significant market shares overseas. Kobo, for example, is tops in Canada and Japan. You can get by just selling your eBook on Amazon—millions of authors do—but it shouldn’t be your only outlet if you have ambitions for your book. TL;DR: Distribute on all eBook platforms. It’s free to set up an eBook title on KDP. You’ll need final book files that meet their quality and content guidelines, but assuming you worked with professional editors and designers who understand book layout and cover design, your final files should be accepted. To sell your eBook everywhere else—Google Play, Apple Books, Nook, Kobo, and more—you have a few options. BookBaby is what we use for Scribe authors, and is a one-stop shop to distribute your book to all the major outlets. There are other options, like Smashwords and Draft2Digital, that you can use to accomplish the same goal. For BookBaby, the cost to set up an eBook depends on how many graphics are in the book. A typical upload costs $249. For each graphic, figure about $2 additional cost. 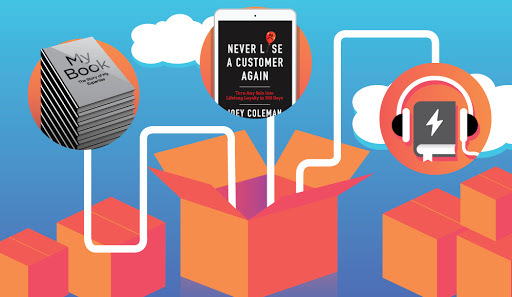 TL;DR: Use KDP and third party platforms to distribute your book everywhere. Should You Do a Paperback? Despite the proliferation of eBooks, the majority of book sales are still physical books. Most authors should print a paperback given that print-on-demand has made it so easy and cheap to distribute high quality copies of your book. Sometimes authors just produce a hardcover for exclusivity and to ensure readers only get the highest quality version of their book. But for the vast majority of authors, a paperback makes sense as an easy way to get physical copies of their book to readers. If you want to sell a paperback, the big question is: how will you print your book? Your options are print-on-demand (POD) and offset printing. With POD, your books are printed as they are ordered, and cost about $4 per book. With offset printing, you print large batches of books, warehouse them, and fulfill orders as Amazon sends you purchase orders. Printers like Bang and Thomson Reuters will warehouse books for you. If you know you’re going to sell thousands of copies of your book—maybe you’re an in-demand speaker or have a huge mailing list—offset printing might be a good option for you. For most authors, POD makes far more sense. There are no upfront costs (besides setup fees), you don’t have to manage orders, and you’re not caught with a garage full of books if you want to change the book after printing 5,000 copies. TL;DR: Most authors should do POD. Upload your book to KDP to sell POD paperbacks across Amazon (free setup). Upload your book to IngramSpark to sell POD paperbacks everywhere else ($49 setup). KDP does distribute paperbacks outside of Amazon (if you register for the Expanded Distribution option), but IngramSpark does a more effective job at distributing to a wider number of retailers. Now let’s talk about distributing a paperback printed using offset printing. To sell on Amazon, you’ll need to apply for an Amazon Advantage account. If you get approved, the account costs $99 a year and pays 45 percent royalties to authors. You will receive purchase orders from Amazon based on their estimates for upcoming sales volume, and you will fulfill those orders directly to Amazon’s warehouse. From there, Amazon will fulfill individual orders to readers. Distribution beyond Amazon will be nearly impossible as a self-published author. IngramSpark does distribute POD paperbacks to bookstores, which means bookstores can buy your book, but the truth is most bookstores won’t. In our opinion, that doesn’t matter. To get into most bookstores, you need a sales rep going store to store to convince them to stock your book. However, this is very difficult to do without going with a traditional publisher, which comes with its own long list of negative consequences. TL;DR: For limited distribution but easy paperback distribution, use KDP. Should You Do a Hardcover? If you want your book to be perceived as higher quality in the eyes of readers, or to be able to charge people more for it, it makes sense to produce a hardcover. TL;DR: You probably don’t need a hardcover (but some authors do). As with paperbacks, your print options for hardcovers are either POD or offset printing. However, KDP does not offer a POD option for hardcovers. Your only option for POD hardcovers is to use IngramSpark, which comes with an occasional problem: some hardcovers can show up as “out of stock” for weeks on Amazon when set up through IngramSpark. At more than $10 per copy, POD hardcovers are also expensive. Offset printing can be much cheaper per copy, once again assuming you know you’ll order thousands of copies. Most authors that we work with do offset printed hardcovers. But if you want hardcovers and don’t need a bunch, IngramSpark is the best bet. TL;DR: Depending on quantity, either option can be best. Set your POD hardcover up with IngramSpark to sell through Amazon. Like paperbacks, IngramSpark will also distribute your book to other major retailers. It’ll be for sale online, but again, don’t expect your book to land in bookstores. If you choose offset printing, it’s the same as discussed above: you need Amazon Advantage. TL;DR: Depends on the printing method you choose. Should You Do an Audiobook? In 2018, audiobook revenue jumped 22.7 percent. Audiobooks are the fastest-growing sector of the publishing industry. To be sure, audiobooks are a nice way to sell more books and reach more readers. That’s why most authors now produce audiobooks to complement their eBook and print version. That said, creating an audiobook is totally different than creating other versions of your book. You’ll need to hire a company to help you produce the audiobook and decide if you want to use a narrator or narrate the book yourself (here’s a piece we wrote on navigating that decision). It’s a lot of work, but if you want to reach the most readers, you should do an audiobook. We use ACX to distribute audiobooks for Scribe authors, and the big question they have to answer when it comes to distribution is whether to use ACX exclusively. If you’re fine with distributing your audiobook through Audible, iTunes, and Amazon, exclusive distribution through ACX is smart. You’ll also get a higher royalty rate of 40 percent. If you want to distribute outside these channels (for example, if you want to sell your audiobook directly on your own website), you’ll only get 25 percent royalty from ACX. Once you have the final audio files, you can submit them to ACX for review. Keep in mind that they have pretty strict standards when it comes to the quality of your audio. There’s no cost to submit an audiobook for distribution through ACX. Today, authors can take more control of their publishing process than ever before. That means more freedom, but also more complication. Rather than blindly following the norm, be intentional about how you want to print and distribute your books to most effectively reach your audience.